If you are looking for information and help with concrete protection in the Baltimore, Maryland, Washington D.C. or Northern Virginia areas, this article will help you to understand the importance of protecting your concrete floors. Concrete maintenance and protection is important for any business or commercial enterprise, and should be taken very seriously. If you’d like to speak with an expert in concrete protection that can answer all of your questions, call (301) 261-4933 or click here to contact us online. Since concrete forms the major foundation of most any building, the proper care and maintenance is crucial to save time and money in repairs and other concrete services. Over time, concrete floors can crack, wear, and receive damage from natural elements like water and weather. These cracks and damages need to be attended to immediately before the situation becomes worse. What happens if the cracks and damages are not taken care of quickly? Cracks become larger, which can be unsafe if your floor is supporting any other floor of your building other than the first. 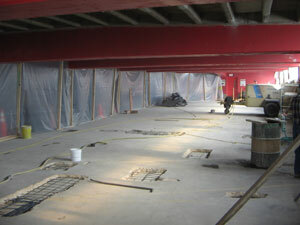 A crack in an elevated floor can cause for unstable support for the people and objects resting on top of the floor. This clearly creates liability for you and your company! Water damage can cause the concrete to become weak, and start to chip and fall apart. One is to do it yourself. If you have the time, and most importantly the experience, you can purchase the necessary materials to repair and protect your concrete floors. But what if you do not have the time or the necessary experience? 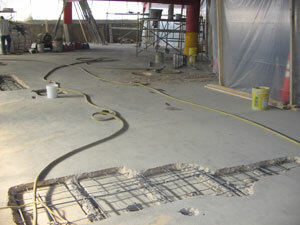 Then you should investigate the second option, hiring a professional commercial/industrial concrete contractor. Operating your business should be your top priority, not performing the maintenance and repairs for your facility. A professional concrete protector can repair any current damages to concrete structures, and keep the concrete protected for years to come. There are many companies to choose from to help protect your concrete floors. Many concrete restoration contractors have their own unique services to offer, to meet your concrete needs. But if you want the most experienced and respected concrete restoration specialists around, and you are located in the Maryland, DC, or Northern Virginia areas (whether in Columbia, Silver Spring, Bethesda, White Marsh, Annapolis, Fairfax, or Arlington) Concrete Restoration Services, Inc. is the concrete expert to accommodate your concrete restoration needs. For almost 30 years, Concrete Restoration Services, Inc. has been helping to protect commercial concrete structures, just like yours, from unwanted damages and costly repairs. With a knowledgeable staff, and the proper experience, Concrete Restoration Services can meet any of your industrial concrete needs. “I had a problem and had to repair concrete steps in early 2009. The building that the staircase is in is a high-traffic parking garage, so I was concerned about how long the repair would take. 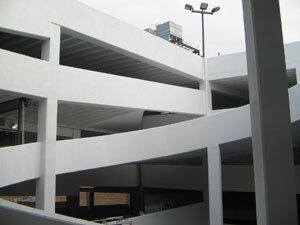 I called Concrete Restoration Services and within hours, they had a concrete repair professional at the parking garage evaluating the extent of the damage. The job was completed by early the following week and I couldn’t be more happy with the results. For an estimate or to ask questions about concrete protection, give us a call at 301-261-4933 or fill out a contact form here. View all of our services here or just contact us to get started!